On a recent plane ride, I was able to watch two movies. Movies for me these days are usually animated and PG so it's rare to watch something for grown ups. I saw Same Kind of Different Like Me and The Greatest Showman. Ok, the latter is not just for grown ups but admiring Hugh Jackman is probably an adult thing, right? Anyway, there was an impact that Same Kind of Different Like Me had on me that is probably NOT what you would expect to hear about in this post. For those who haven't seen the movie, I believe the main plot of the story is to illustrate a woman's generous and thoughtful heart in getting homeless shelters to be "homes" for the homeless. The twist is that she becomes terminally ill. In the movie Same Kind of Different Like Me, which is based on a true story, Debbie, the woman who set off to change the stigmatism of homeless shelters, told her grown children to let their father be happy after she has passed away. She gave them her blessing to marry whomever they choose to, therefore, they should let their father do the same. Tears from the kids. Then the husband came to sit with Debbie on the couch. She told him that it's ok if he wants to be with someone after she dies - even the one he had an affair with. The husband shared his regret about the extra-martial affair. And this is the point in the movie where I deeply connected with this woman named Debbie. She told him, if it wasn't for the affair, they would have never found each other again and become stronger as a couple. My heart did a triple flip because I saw that same silver lining thirty scenes prior but thought I must be nuts to see things that way. He cheated on her! How can Debbie and I see it in a positive way? As the movie continued, we see just how important it was for this couple to rekindle and improve their intimacy. Their renewed relationship is THE KEY FACTOR in why many homeless shelters all over the country changed. This is an example of being thoughtful for the good of many people. Debbie took her wounds and used them wisely. Not too many people would see things the way Debbie did. First, her vision of flowers and nice amenities for homeless shelters was unique. And second, her ability to see past the ugly affair and see the blessing - the silver lining that comes out of it. Who does that? Someone thoughtful in every way. Shutting doors on ugly hardships causes us to miss what is better because of it. Debbie could have made her husband "pay" for his mistake in a different way - the tabloids are full of how broken up couples are "sticking it" to each other. However, she didn't need anything like houses, jewelry or expensive paintings. What she needed was her husband's bare hands and open heart to help her mission of getting this homeless shelter off the ground. Genius! What a thoughtful way to use her resources! Both of these gals are The Same Kind of Different as Me. I hope to both teach and learn from my daughter and my mother how to see things differently. 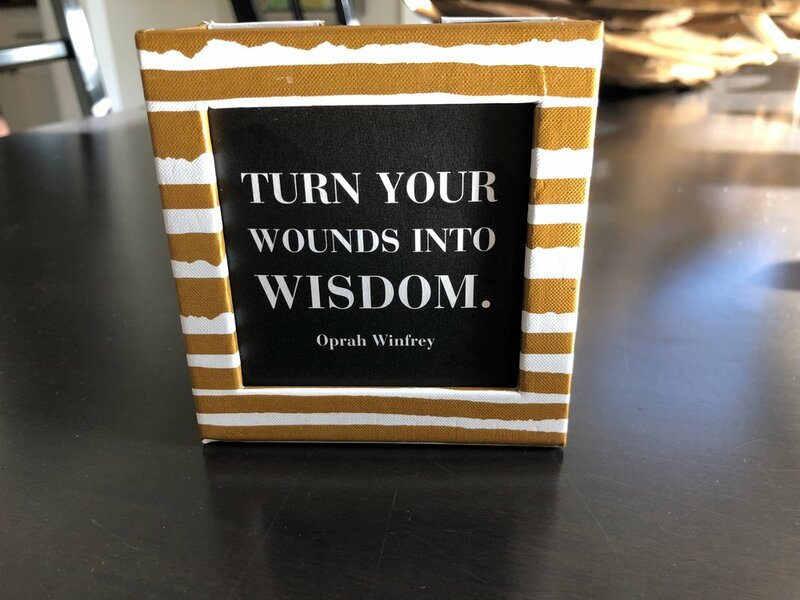 May we always "turn wounds into wisdom" like Oprah advises. I'm such a sucker for stories about people who make lemonade out of the lemons. I grow every time I learn the wisdom from those who share these stories. I'm again reminded that we can all choose to see things differently. My wish is to continue to believe in the positiveness of every situation. I want to see the silver lining in every uncomfortable moment. I want to find the blessing in every mistake I make. I could have been grumpy about taking five and half hours via plane to get to Fort Lauderdale when it only takes three. But I was with the hub and I got to watch two movies - what a blessing! He chose the movie and we watched it together. For this thoughtful pinch, I am grateful to Debbie Hall.